Earvin Miers is a sophomore political science major from Duck Hill, Mississippi. In his free time, he likes to work out, run, play tennis and read. He loves politics, art, history and fashion. The Purple and White: What made you come to Millsaps? 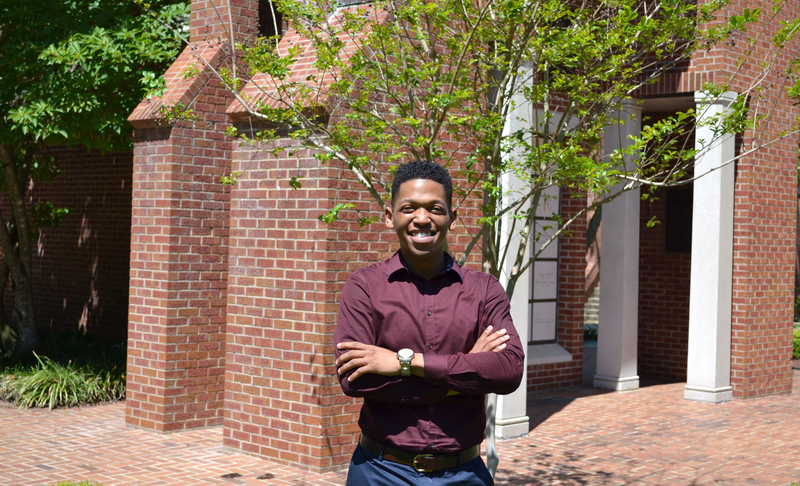 Earvin Miers: Well, the number one reason was because it was in Jackson, Miss., and with me doing law, I thought that this would be a good environment for me. I’m right down the street from everything dealing with law-making. It (is) also a liberal arts college, and I thought that would be different from the traditional university. P&W: Where do you see yourself after graduating from Millsaps? EM: I plan on applying to law school at (Mississippi College) and I pray and hope that I get a good scholarship to go to MC Law. P&W: Where is your favorite place on campus? EM: The library because I get all my work done. I like it, it’s quiet. P&W: What type of music is your favorite to listen to? What’s your favorite song? EM: Anita Baker. “Angel” by Anita Baker—that’s my favorite song. No matter how stressed out, how mad I am…when I listen to that song, everything goes away and it puts me on cloud nine. Oh, and I like Solange’s, “Cranes in the Sky.” That song really means a lot. P&W: If you could have a one-hour phone conversation with someone from the past, who would you call and why? EM: Medgar Evers, because I feel like when I started my journey to go after my political science degree, I looked at people like him and Thurgood Marshall and I kind of wanted to be like that. They had so much impact on civil rights and the black community. P&W: Who has had the biggest impact on the person you’ve become? EM: My family. I wouldn’t say one particular person. My family, on my mom’s side, has really shaped me into the person I am today… uncles, aunts, cousins, and I really know that they have my back, no matter what I go through or try to put my mind towards. Even if I don’t believe in myself, they’re going to push me to do my best. P&W: What’s something that you do to improve your mood when you’re down or stressed? EM: I go running. That helps every time. P&W: What’s something that annoys you? EM: I hate when people burp and don’t say excuse me. That is so annoying. I really realized how much I hated that in class one day. P&W: If you could have an all-expenses paid trip to anywhere in the world, where would you go and why? EM: Dubai, and it would have to be enough money for me to actually go there and spend money too. Dubai is expensive. I’d just want to drive a Lamborghini, ride some camels, live in the most expensive hotel, shop, and eat… It would be amazing. P&W: What are you doing this summer? EM: I’m doing an internship in Washington, D.C. with the Congressional Black Conference and I’ll be working in the office with Bennie Thompson. P&W: Describe yourself in three words. EM: Reserved, smart, and classic. The Purple and White thanks Earvin for answering these questions! If you or someone you know would like to be featured in the next “Meet the Millsapian” article, you can email me at clevecd@millsaps.edu.